In the London release, ServiceNow is introducing support for custom domain names. What this means is that anywhere a full URL is generated (usually notifications) we'd need to make sure that we're making the URL's properly. I've most often seen and used the instance_name property to get the hostname and then added that in with ".service-now.com". The new feature should be backwards compatible so things won't break but it won't use the new domain should they start using that. Moving forward we should instead use the following to get the full domain name and then we just need to add the specific path after it. Which in London release could be configured as https://servicenow.crossfuze.com/ or whatever else we want. I've run into an issue several times lately and wanted to make a note for myself and thought I'd share it at the same time since it wasn't easy to find in the documentation. When using a Table Name field on a scoped table there is a restriction by default that only allows tables from the applications scope to be selected in the field. Every time I've used this type of field I've needed to show other tables, particularly Task tables. The fix is a simple, though obscure, attribute that can be added to the field. Go to the dictionary record of the Table Name field with the issue. Click the New button in the Attributes related list. Select the "Allow public" attribute. Here's a script that goes through the workflow activity fields and prints out where the group is listed in workflows. Editing formatted text in a web browser has come a long way over the years. This is true within ServiceNow as well. In general it's pretty easy to write a knowledge article and format things the way you want. Unfortunately there's a gap between just formatting it the way you want and having consistent formatting across the entire knowledge base, system, and self-service portals. A lot of what I do is work with the CMS and now Service Portal within ServiceNow. If you don't know these are the sections of the tool that allow for creating a branded portal for end-users to interact with IT and other areas of the business support side of things. When you're working on a portal you build out the blocks, widgets, lists, menus, etc. and from the overall structure perspective you're in control. But as soon as you introduce the knowledge base and the articles that are created by anyone and everyone, consistency tends to go out the door. 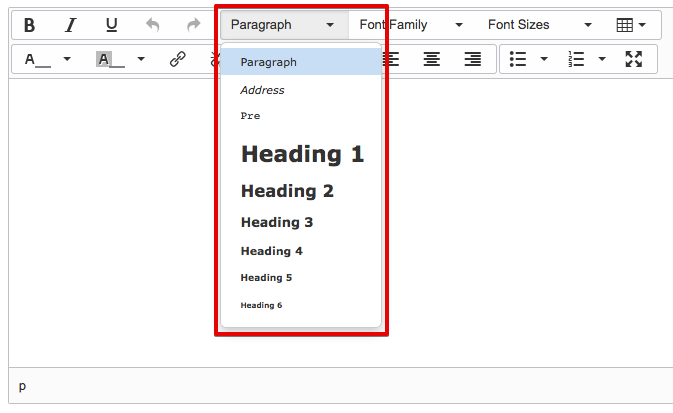 The default editor for formatting text in an article (and elsewhere in ServiceNow) is used and offers options for selecting the font, font size, bold, italics, underline, etc. This works ok if you're looking at all of the content in one place, but when you start to look at styles across articles and compared to other places in the self-service portal this starts to cause problems. Any good portal is going to come with a decent set of default styles for headings, paragraphs, links, etc. But the default editor options don't include any way to tie into these unless you are an HTML wizard and can edit the source. Fortunately, there is a system property that allows us to add the common HTML tags that allow us to use these standard formats. The glide.ui.html.editor.v4.toolbar.line1 property contains the list of options available in the editor. I strongly suggest adding in the formatselect option with gives the Paragraph and Heading options so users can select a title and the various section headers and apply formatting automatically that will be consistent across the site. The property can be found under System Properties -> UI Properties. After you've got the property updated, a little bit of training to help the big contributors to start using it and your site should start to have a much more consistent look and feel. In ServiceNow and Service Portal there are some great features in a lot of places. There are, however, a number of rough edges since it's still pretty new. One of the places that I've found is a little rough is with the CSS. Many of the default widgets delivered by ServiceNow use the bootstrap panel structure. This gives a pretty nice format for setting up blocks with headings. The problem is that most of the brand colors are not supported. It instead uses the default Bootstrap colors. The solution to this is to add the following styles to the widget CSS. It could also be added to the page CSS if you don't want to modify the widget. This code utilizes the brand colors set in the Branding Editor to apply the colors. If you're building a self-service website, when dealing with the stuff relating to the user, you should most definitely use "Your" not "My". I've done a lot of work in the self-service side of ITSM over the years. Much of this has been with ServiceNow as the environment. I've also dabbled in various levels of web development and interface design. A very common mistake and point of argument is that the menu link should be "My [stuff]". I'm not sure where this got started but I'm guessing it has something to do with wanting to make people feel at home and in control of the situation when dealing with a website. Either that or someone was lazy and just not thinking things through. When I am dealing with a website me, my stuff, my computer, etc. is on my side of the network connection. The company, website, forms, information, etc. is another entity that I am having a dialog with. Flip that around and as a website developer I'm creating the dialog between the organization or company I represent and the end user. This means that when I'm giving instructions I will say "Here's what you need to do..." and anything that discusses the organizations thoughts, interests, etc. should take a first person narrative of "we", "us", "our", or in the case of a personal blog or something like that, "I", "me", and "my". I ran into a page today where I realized there was a sentence explaining how something works with "you can go to...and this is where you'll find...". Right below that there was a block label "My Approvals" where the approvals of the end user, not the organization, can be found. It seems like a pretty minor thing and enough websites have flip-flopped with these that most people aren't going to think too much of it but somewhere in the back of their mind something is going to be saying "hey, something is not quite right here". As an example of a site that has done this the right way, check out Amazon and their numerous links to "Your Account", "Your Orders", etc. On a somewhat related note, I've also heard discussions on what form to put documentation for a system into. Should it be first person? Or perhaps an awkward neutral set of instructions that's cold and strictly business? This one often isn't quite as straight forward but I always appreciate the information that's written as more of an honest dialog that clearly articulates who is talking and who is listening. Making things a little more personal in a formal business world can often ease a little stress of a situation since it's just more natural. So to sum it all up, here is my post that will hopefully persuade you to make your sites better at telling me when there is stuff relating to me with a link titled "Your stuff". Just to be as clear as mud. Today I was testing out some functionality in Helsinki and ran into a really ugly error with something that worked perfectly fine in Geneva. After a little digging I discovered that the format for JSON was updated as well and is more strict now. So if you're doing any parsing of JSON in ServiceNow, make sure your property names use double quotes instead of single quotes and you'll save yourself some trouble. This is mostly for my personal reference but here is the info on what icons are available as taken from the ServiceNow Community Forum. Thanks to Shahid Shah for putting this out there. Have you ever wanted to just get a quick GlideRecord Query for a list you're looking at? I've wanted to do that many times. Sometimes it's because I'm writing a business rule and sometimes I've got to run a background script to update some values. I finally took a couple minutes and put together a rather simple script that does just that. Now that you've got this, from any List you can right-click on the header and the bottom option will be "Get GlideRecord Query" and you can copy the resulting code. It's nothing complicated, but can still save a bit of time. The key to making this work is the g_list object that has the details for the list that you're on. It's documented fairly well on the ServiceNow Wiki and if you haven't seen it before I'd recommend glancing at what options are available.